Gridlock Lacquer is an indie polish brand from Buffalo, NY, and today I have the entire Niagara Falls Collection* ($7 USD each) to share with you! 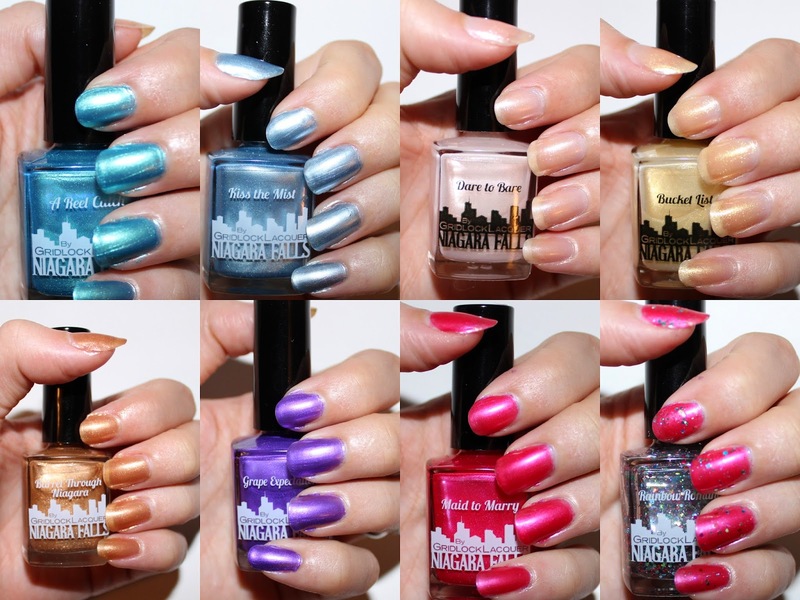 This collection contains 8 polishes that were inspired by different Niagara Falls locations and attractions - how fun! A Reel Catch - This is the polish that I chose as my mani at the Gridlock Lacquer Mini Mani Event! This shade is a gorgeous bright aqua colour with a foil finish. Barrel Through Niagara is a sheer gold-bronze. I used three coats, and the colour never achieved opacity. I do wish that this colour was more opaque, as I love my gold polishes! Bucket List is a shimmer pale yellow gold shimmer. I think that this polish would look gorgeous as a shimmer top coat over black or yellow polishes! Dare to Bare is another sheer shimmery polish. This shade is super office-appropriate while still being a bit more fun than your standard creme beige colour. I also think that this would look great as a shimmer top coat. Grape Expectations is a gorgeous blue toned purple polish with a metallic finish. This formula is a bit thin, so I did need three coats for an opaque finish. I loved that I wasn't left with brush stroke marks! Kiss the Mist is a metallic silver-blue shade with a thin formulation. I needed three coats for an opaque finish, and I did have some issues with bald spots by my cuticles. This is a polish that you'll need to take your time with to ensure a perfect finish. Maid to Marry seemed to be the stand out shade at the Mini Mani Event! This pink polish has a beautiful frosty finish, and it looks great on many different skin tones. Rainbow Romance is the glitter top coat in this collection! I used one coat of Rainbow Romance over two coats of Maid to Marry, but the glitter could also be built up with additional coats. This glitter contains every shade shade of the rainbow - hence the name! So, you'll be able to layer it over almost any polish. My favourite shades from this collection are Grape Expectations, A Reel Catch, and Bucket List. These polishes are available for purchase on the Gridlock Lacquer site, as well as in select retail stores in the Buffalo/Niagara area. Have you tried any polishes from Gridock Lacquer yet? What's your favourite shade from the Niagara Falls Collection? Loving the blue and teal!! Very pretty colours! Love "Kiss the Mist" What a great collection!